Spring Commencement 2019 Please refer to GraduationServices.IllinoisState.edu for more information. 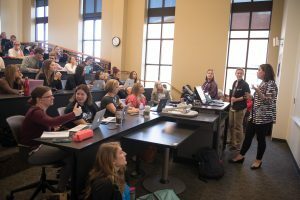 This conference was created for Illinois State University teacher education graduates who have completed one to four years of teaching. This year's conference is Friday, June 21, 2019 from 8 a.m. - 4 p.m. in the State Farm Hall of Business. Register by June 10. Professional development hours will be available. This year's keynote speaker is Na'ilah Suad Nasir, renowned author and the sixth President of the Spencer Foundation. Come one. Come all. 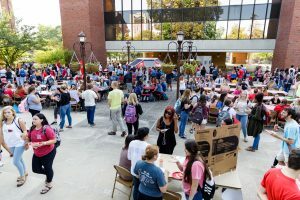 Connect with our Registered Student Organizations, faculty, and other education students for a back-to-school celebration with pizza, drinks, and fun! The Teaching in the 21st Century Conference (T21CON) is a free, hands-on, engaging learning opportunity designed for current and aspiring educators to gain an edge in using technology in the classroom. The effective integration of educational technologies has become increasingly important for today’s learners. T21CON connects attendees with resources, strategies, and a network of experts to support their careers in education. Learn how to create a curriculum vitae for a job application, research proposal or graduate school application.